Osteoarthritis (OA) is a clinical syndrome of joint pain which is characterized by gradual loss of articular cartilage, osteophyte formation, subchondral bone remodeling, and inflammation of the joint. OA knee is a major source of disability worldwide owing to pain and loss of function. When oral analgesics are ineffective, intra-articular (IA) injection (corticosteroids, viscosupplements, blood-derived products, prolotherapy) is the last nonoperative modality that can be performed., Synovial inflammation plays a critical role in the symptoms and structural progression of OA. Prolotherapy is an emerging cost-effective treatment option for chronic musculoskeletal pain conditions including OA knee. It involves the injection of a small amount of an irritant substance (most commonly, hypertonic solution of dextrose) into synovial space. It is presumed to work by several mechanisms including a direct, an osmotic, and an inflammatory growth effect. The hypothesized mechanisms for pain relief include stimulation of local healing among chronically injured extra- and intra-articular tissues, reduction of joint instability through the strengthening of stretched or torn ligaments, and stimulation of cellular proliferation. To the best of our knowledge, no study till date has compared the efficacy of IA steroids with prolotherapy for pain relief in patients of OA knee. Therefore, this study was undertaken to compare the efficacy of IA steroids with prolotherapy. This prospective randomized double-blinded study was conducted on patients visiting pain clinic OPD of our institute from September 2017 to August 2018. Prior institutional ethics committee approval (Ref. code: 88th ECM II B-Thesis/P19) and written informed consent from the patients were obtained. This study is registered with Clinical Trials Registry of India (CTRI/2018/05/014227). We enrolled 70 adult patients aged 40–70 years, of knee OA Grade I or II having pain with Visual Analog Scale (VAS) score >5. Patients giving negative consent, with inflammatory arthritis, for example, Rheumatoid arthritis, diabetes mellitus, history of recent surgery or IA injection of steroid or HA in last 3 months, platelet count <150,000/mm3, on anticoagulant therapy, any liver or hematological or coagulation disorders, any active local site infection, or malignancy were excluded from the study. 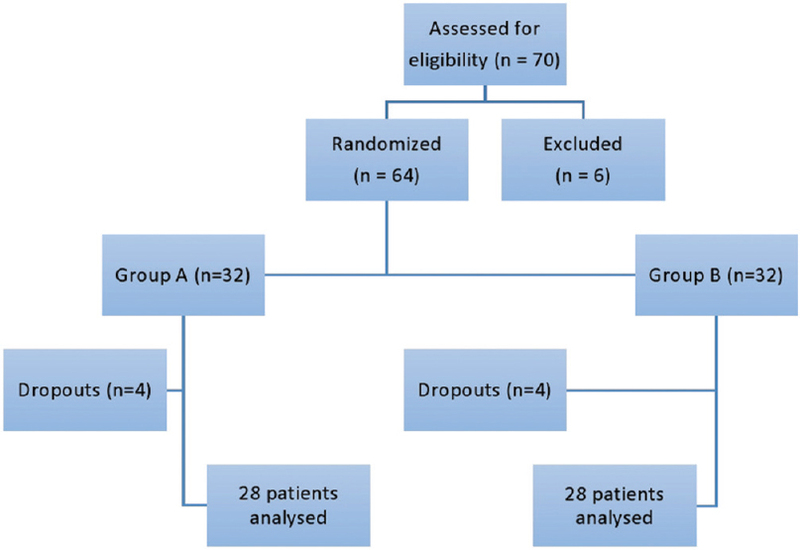 After excluding 6 patients, 64 patients scheduled for IA knee injection were randomly allocated to two groups of 32 each using a sealed envelope method. A computer-generated random allocation sequence, concealed in 64 consecutively numbered, sealed envelopes, mentioning group distribution, was prepared by a ward nurse not involved in the trial. After explaining the procedure and taking proper written and informed consent, the patients were taken in the procedure room. Before the procedure, baseline VAS score was measured and baseline quality of life (QOL) score was measured by filling McGill QOL questionnaire. The assigned envelopes were opened by enrolled patients on the day of injection for group allocation. All the monitors were attached (i.e. pulse oximeter, noninvasive blood pressure, and electrocardiogram). An anesthesia technician, otherwise not involved in the study, prepared the injections (total volume 6 ml) depending on the group allocated. Group B (steroid): solution consisted of 40 mg (1 ml) triamcinolone acetonide, 1 ml of lignocaine 2%, and 4 ml sterile water. The patients were laid supine with a small pillow or bolster under the knee to place the joint in mild flexion. The part was cleaned properly and draped under proper aseptic conditions. Using anterolateral approach, anterior aspect of the knee was palpated to locate the patellar tendon. Moving 1 cm lateral to patellar tendon, a depression was present which marked the entry point of needle. A 10 ml syringe with 21-gauge needle was used. The needle was placed perpendicular to the skin with tip of needle directed at 45° angle into the center of knee. The placement of needle was confirmed by C-arm. The needle was aspirated to look for any fluid. The drug was then injected into the joint space depending on the group allocated. After the injection, patients were advised on relative knee rest for 2–4 days with progressive resumption of routine activity over 1 month. The patients were asked to take paracetamol tablets in case of any complaint of pain during the study period. They were discouraged from using NSAIDs and from starting new therapies for pain during the study period. The injections were repeated at 1 and 2 months irrespective of any relief in symptoms and were given only after recording VAS and QOL scores. All the parameters including VAS scores were recorded by an assessor who was unaware of the group allocation and did not participate in the IA injection of drugs. Follow-up was done through OPD visits of patients at 1 week and at monthly intervals upto 6 months and through regular telephonic communications regarding pain relief with respect to VAS score, requirement of rescue analgesics and improvement of QOL (using McGill QOL Questionnaire). We also looked for any side effect after injection. The VAS score ranged from 0 to 10, with 0 indicating no pain and 10 indicating the worst imaginable pain. All the above parameters were recorded, and appropriate statistical tests were applied on collected data. The statistical analysis was done using Statistical Package for Social Sciences (SPSS Inc., Chicago, IL, USA) Version 21.0. All normally distributed, continuous variables were presented as mean ± SD To compare the means between or within independent groups, the independent samples t-test was used. The Chi-square test was used to compare proportions as appropriate. The VAS pain scores and the QOL score were analyzed using the Mann–Whitney U test. P < 0.05 was considered significant. The results were analyzed using paired t-test for continuous, and Chi-square test for categorical variables. Based on previous studies,, the hypothesized difference of 1.2 in terms of VAS was considered to be clinically significant. Assuming a type I error of 0.05 and a desired power value of 80% using the two-tailed Z-test for proportions, 28 patients were calculated as the minimum sample size for each group. The significance level of the test was targeted at 0.05. Considering possible dropouts, 35 patients were included in each group. Among the seventy patients who were enrolled for the study, 6 were excluded as they were found to have diabetes mellitus. Of the remaining 64 patients included in study, only 56 patients completed the study [Figure 1]. Four patients in Group B were excluded as they discontinued treatment in-between. Four patients in Group A were excluded from the study following initial randomization and were not considered for further analysis; three patients preferred to undergo total knee arthroplasty while the other patient did not come for follow-up. There was no difference between groups regarding age, gender distribution, grade of OA, side of knee involved, and mean platelet count [Table 1]. There was decrease in mean VAS score from baseline in both the groups, and it was lower in steroid group as compared to prolotherapy group at all intervals. The difference in the VAS score between both the groups was also statistically significant (P < 0.05) at all the follow-up time intervals except at 3 months (P = 0.094) [Table 2]. There was improvement in QOL of patients in both the groups as evident from decrease in mean QOL scores from baseline at all the subsequent intervals. At all the time intervals, mean QOL scores were lower in steroid group as compared to prolotherapy group. The difference between both the groups was also statistically significant (P < 0.05) at all the follow-up time intervals except at 2 months (P = 0.080) and 3 months (P = 0.185) [Table 3]. Overall requirement of rescue analgesic, total doses of rescue analgesic consumed, and incidence of side effects were more in prolotherapy group [Table 4]. This further supports the superiority of analgesic efficacy of IA steroids over prolotherapy. Our study showed that both steroid as well as prolotherapy were effective in the nonoperative management of patients with knee OA, but steroid was much better in relieving pain as well as QOL of the patients. Many studies done in past have shown the efficacy of IA injection of steroids in decreasing pain in patients with OA knee. Raynauld et al., in their study, reported that OA patients who received long-term intra-arterial injections of triamcinolone acetonide showed improvements in pain (described in terms of WOMAC pain subscale) compared with the saline control patients. Shikhar et al. observed that use of IA corticosteroids was safe and could be beneficial in providing short-term as well as long-term pain relief from OA knee. The findings of their studies are in agreement with that of our study in which IA injection of triamcinolone acetonide resulted in a decrease in VAS score from 6.36 ± 0.99 at baseline to 4.32 ± 0.82 at 1 month and 3.14 ± 0.89 at 6 months. Another study conducted by Dieppe et al. showed that IA steroid injections caused a significantly greater reduction in pain and tenderness than placebo injections and were preferred by patients. There are some other studies in which triamcinolone was found to be better than other steroids. Pyne et al. reported that triamcinolone was statistically more efficient in pain relief than methylprednisolone 3 weeks after injection. In a 6-month randomized study, Valtonen  showed that multiple triamcinolone injections provided more long-term beneficial effects in patients with symptomatic OA as compared to betamethasone. Furthermore, Blyth et al. found triamcinolone to be more efficacious than hydrocortisone for relieving IA pain. Based on all these studies, we selected triamcinolone for our study, and out of triamcinolone acetonide and hexacetonide, we used triamcinolone acetonide because it was relatively easily available in our setup. We used a dose of 40 mg of TA as it was found to be clinically effective for relief of symptoms of OA knee in many previous studies like that of Raynauld et al. and Jain and Jain  A systematic review with meta-analysis by Godwin and Dawes  had concluded that intra-articular corticosteroid injection results in clinically and statistically significant reduction in osteoarthritic knee pain 1 week after injection. They further concluded that the beneficial effect could last for 3–4 weeks but was unlikely to continue beyond that. Similarly, Bellamy et al. and Ravaud et al. had also found only short-term pain relief (up to 4 weeks) from IA corticosteroids after which their effects reduced gradually. Based on these evidences, we kept the timing for repeat injections at 1 and 2 months after the first one. There are a number of studies which found prolotherapy to be beneficial in alleviating pain of OA knee. Reeves et al. in their study reported that dextrose prolotherapy injection was clinically superior to bacteriostatic water in treatment of OA knee, with substantial improvements in joint pain, subjective joint swelling, flexion range of motion, and tendency for knee buckling. Furthermore, Sit et al. in their systematic review concluded that prolotherapy is significantly beneficial in the treatment of OA knee. In our study also, prolotherapy was found to be efficacious in relieving pain of OA knee from a VAS score of 6.71 at baseline to 5.25 at 1 week and 4.07 at 6 months. Though IA steroids has never been compared with prolotherapy in knee joint, there had been few studies which compared IA steroids with prolotherapy in joints other than knee to compare their efficacy in relieving pain. Jahangiri et al. while comparing IA steroid with prolotherapy in their study found that the pain relief in both the groups was comparable at 2 months, but the results were better for corticosteroid at 1 month, and apparently more favorable outcome for prolotherapy at 6 months (with mean difference [95% CI] in VAS = 1.1 [0.2, 2.0], P = 0.02). In another study conducted by Kim et al., authors reached to the conclusion that IA prolotherapy provided significant relief of sacroiliac joint pain, and its effects lasted longer than those of steroid injections. In both the above studies, prolotherapy was found to be more beneficial than IA steroids. This disparity in their results with ours could be due to a different joint involved, different drug used (methylprednisolone acetate by Jahangiri et al. ), different dose of drug used (1 ml by Jahangiri et al. and 2.5 ml by Kim et al. ), and different local anesthetic agent used for dilution (2% lidocaine by Jahangiri et al. and 0.25% levobupivacaine by Kim et al.). The QOL has never been studied as separate entity to compare steroid and prolotherapy in knee OA. However, in the previous studies, various other means have been used such as range of motion, WOMAC (Western Ontario and Mc Master Universities OA Index) function score, Oxford knee score (OKS) questionnaire, joint stiffness, etc., to assess the functional improvement of the knee joint and QOL of the patient. In our study, we compared the improvement in QOL in terms of score depending on the answers given to McGill QOL questionnaire. We observed that the mean QOL scores at baseline were comparable in both the groups, the score being slightly higher in prolotherapy group as compared to that of steroid group but the difference was not statistically significant. At all the subsequent follow-up intervals, there was more improvement in the steroid group, and the difference in scores between two groups was statistically significant except at 2nd and 3rd month. In their study, Raynauld et al. demonstrated that the OA patients who were administered triamcinolone acetonide intra-articularly had significantly greater range of movement and improvement in joint stiffness than the patients receiving saline. They found an improvement in WOMAC function score which is in agreement with the findings of a decrease in QOL scores in our study. Buyuk et al. also reported that IA steroid, i.e. triamcinolone and methylprednisolone are effective at improving function in patients with OA knee. Jain and Jain  also found an improvement in the WOMAC scores with steroids which were comparable in both triamcinolone and methylprednisolone groups. Shikhar et al. observed improvement in QOL with steroids (methylprednisolone and triamcinolone). Jain et al. also reported the role of steroids (methylprednisolone and triamcinolone) in improving the stiffness and joint function. In a study by Eslamian et al., they concluded that dextrose prolotherapy resulted in significant improvement of validated pain, ROM, and WOMAC-based function scores, when baseline levels were compared at 24 weeks. Rabago et al. found significant improvements in composite WOMAC scores at 26 and 32 weeks which remained stable up to 52 weeks for the dextrose “prolotherapy” group compared with “saline injections” and “at home exercise” groups. On completing OKS questionnaire which included important functional points (amount of the time able to walk without pain, limping, or giving way the knee, etc. ), Farpour et al. concluded that dextrose prolotherapy improves the functional status of knee joint. Sit et al. also stated that IA dextrose prolotherapy provide immediate, practical benefits to individual patients and improved QOL. A study was conducted by Jahangiri et al. to compare the efficacy of prolotherapy with IA steroid in first carpometacarpal joint in terms of joint function. They found that both prolotherapy and corticosteroid injection increased functional level, but prolotherapy seemed to be more effective (mean difference [95% CI] in total function score = 1.0 [0.2, 1.8], P = 0.01). The discrepancy between our study and their study might be because of use of a different steroid (methylprednisolone acetate), different dose of drug (1 ml), different local anesthetic agent used for dilution (lidocaine 2%), different questionnaire for assessment of QOL, and involvement of a different joint in which the drug was administered. In our study, we also compared need for rescue analgesia between IA steroids and prolotherapy and found a greater need for rescue analgesics (paracetamol tablets) post-prolotherapy (50% patients) as compared to postintraarterial steroid injection (35.7% patients) pointing toward much better pain-relieving efficacy of steroids than prolotherapy. Just like the number of patients requiring rescue analgesic, the total doses of rescue analgesic (paracetamol tablets) consumed were also lesser post-IA steroid injection compared to postprolotherapy. However, the difference between the two groups was not statistically significant (P = 0.538). As far as the incidence of side effects are concerned, it was more in prolotherapy group (4 patients [14.3%] vs. 2 patients [7.1%]). In prolotherapy group, one patient experienced flare, one complained of nausea, one patient had redness over the injection site, and one complained of pain post injection at local site. Whereas in steroid group, both the patients complained of nausea and no other side effect. There was no significant difference between the two groups with respect to side effects. First, the sample size was not large enough to reveal significant between-group differences in clinical efficacy data and detect uncommon adverse events. Another limitation was the use of VAS score for assessing pain as it is a subjective test for evaluating outcomes and is subject to bias. Lack of a control (placebo) group and limited timeframe for the study were other limiting factors. We concluded that both steroid (triamcinolone acetonide) and prolotherapy (25% dextrose) are effective as IA injections in knee joint for providing pain relief and improving QOL in patients of OA knee; however, steroid is more efficacious than prolotherapy for both. As both provide analgesia by different modes of action, a multimodal approach can be used to provide more complete analgesia with minimal side effects. Martel-Pelletier J, Boileau C, Pelletier JP, Roughley PJ. Cartilage in normal and osteoarthritis conditions. Best Pract Res Clin Rheumatol 2008;22:351-84. National Collaborating Centre for Chronic Conditions (Great Britain), National Institute for Clinical Excellence (Great Britain). Osteoarthritis: National Clinical Guidelines for Care and Management in Adults. London: Royal College of Physicians; 2008. Kon E, Filardo G, Drobnic M, Madry H, Jelic M, van Dijk N, et al. Non-surgical management of early knee osteoarthritis. Knee Surg Sports Traumatol Arthrosc 2012;20:436-49. Goldring MB, Otero M. Inflammation in osteoarthritis. Curr Opin Rheumatol 2011;23:471-8. Ostergaard M, Halberg P. Intra-articular corticosteroids in arthritic disease: A guide to treatment. BioDrugs 1998;9:95-103. Jessar RA, Ganzell MA, Ragan C. The action of hydrocortisone in synovial inflammation. J Clin Invest 1953;32:480-2. Hauser RA, Hauser MA, Baird NM. Evidence-based use of dextrose prolotherapy for musculoskeletal pain: A scientific literature review. J Prolotherapy 2011;3:765-89. Vora A, Borg-Stein J, Nguyen RT. Regenerative injection therapy for osteoarthritis: Fundamental concepts and evidence-based review. PM R 2012;4:S104-9. Cohen SR, Mount BM, Strobel MG, Bui F. The McGill quality of life questionnaire: A measure of quality of life appropriate for people with advanced disease. A preliminary study of validity and acceptability. Palliat Med 1995;9:207-19. Buyuk AF, Kilinc E, Camurcu IY, Camur S, Ucpunar H, Kara A. Compared efficacy of intra-articular injection of methylprednisolone and triamcinolone. Acta Ortop Bras 2017;25:206-8. Soliman DM, Sherif NM, Omar OH, El Zohiery AK. Healing effects of prolotherapy in treatment of knee osteoarthritis healing effects of prolotherapy in treatment of knee osteoarthritis. Egypt Rheumatol Rehabil 2016;43:47. Raynauld JP, Buckland-Wright C, Ward R, Choquette D, Haraoui B, Martel-Pelletier J, et al. Safety and efficacy of long-term intraarticular steroid injections in osteoarthritis of the knee: A randomized, double-blind, placebo-controlled trial. Arthritis Rheum 2003;48:370-7. Shikhar P, Pandey JK, Narayan A, Mahajan R. A prospective clinical evaluation between intra-articular injections of methyl prednisolone and triamcinolone in osteoarthritis of knee based on the efficacy, duration and safety. Int J Curr Microbiol Appl Sci 2013;2:369-81. Dieppe PA, Sathapatayavongs B, Jones HE, Bacon PA, Ring EF. Intra-articular steroids in osteoarthritis. Rheumatol Rehabil 1980;19:212-7. Pyne D, Ioannou Y, Mootoo R, Bhanji A. Intra-articular steroids in knee osteoarthritis: A comparative study of triamcinolone hexacetonide and methylprednisolone acetate. Clin Rheumatol 2004;23:116-20. Valtonen EJ. Clinical comparison of triamcinolonehexacetonide and betamethasone in the treatment of osteoarthrosis of the knee-joint. Scand J Rheumatol Suppl 1981;41:1-7. Blyth T, Hunter JA, Stirling A. Pain relief in the rheumatoid knee after steroid injection. A single-blind comparison of hydrocortisone succinate, and triamcinolone acetonide or hexacetonide. Br J Rheumatol 1994;33:461-3. Jain P, Jain SK. Comparison of efficacy of methylprednisolone and triamcinolone in osteoarthritis of the knee: A prospective, randomized, double-blind study. Int J Sci Stud 2015;3:58-62. Godwin M, Dawes M. Intra-articular steroid injections for painful knees. Systematic review with meta-analysis. Can Fam Physician 2004;50:241-8. Bellamy N, Campbell J, Welch V, Gee TL, Bourne R, Wells GA. Intraarticular corticosteroid for treatment of osteoarthritis of the knee. Cochrane Database Syst Rev 2008;29:1-20. Ravaud P, Moulinier L, Giraudeau B, Ayral X, Guerin C, Noel E, et al. Effects of joint lavage and steroid injection in patients with osteoarthritis of the knee: Results of a multicenter, randomized, controlled trial. Arthritis Rheum 1999;42:475-82. Reeves KD, Hassanein K. Randomized prospective double-blind placebo-controlled study of dextrose prolotherapy for knee osteoarthritis with or without ACL laxity. Altern Ther Health Med 2000;6:68-74, 77-80. Sit RW, Chung VCh, Reeves KD, Rabago D, Chan KK, Chan DC, et al. Hypertonic dextrose injections (prolotherapy) in the treatment of symptomatic knee osteoarthritis: A systematic review and meta-analysis. Sci Rep 2016;6:25247. Jahangiri A, Moghaddam FR, Najafi S. Hypertonic dextrose versus corticosteroid local injection for the treatment of osteoarthritis in the first carpometacarpal joint: A double-blind randomized clinical trial. J Orthop Sci 2014;19:737-43. Kim WM, Lee HG, Jeong CW, Kim CM, Yoon MH. A randomized controlled trial of intra-articular prolotherapy versus steroid injection for sacroiliac joint pain. J Altern Complement Med 2010;16:1285-90. Eslamian F, Amouzandeh B. Therapeutic effects of prolotherapy with intra-articular dextrose injection in patients with moderate knee osteoarthritis: A single-arm study with 6 months follow up. Ther Adv Musculoskelet Dis 2015;7:35-44. Rabago D, Patterson JJ, Mundt M, Kijowski R, Grettie J, Segal NA, et al. Dextrose prolotherapy for knee osteoarthritis: A randomized controlled trial. Ann Fam Med 2013;11:229-37. Farpour HR, Fereydooni F. Comparative effectiveness of intra-articular prolotherapy versus peri-articular prolotherapy on pain reduction and improving function in patients with knee osteoarthritis: A randomized clinical trial. Electron Physician 2017;9:5663-9.